For years, I have been wondering why I can do almost anything with my mobile phone, but when it comes to my television or garage door, I have to resort to another remote control entirely. Why can’t I control everything with a mobile like my BlackBerry? This is the question that Unify4Life is answering with two new devices: the AV|Shadow and the Garage|Shadow. The AV|Shadow allows for switching channels, selecting chapters for a DVD, and even allows for adjusting the volume on the user’s audio receiver. It uses Bluetooth Technology, so the user doesn’t have to point at the screen or any other video device. 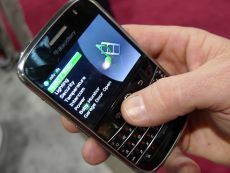 The user can customize their own settings, and the interface is set up in a circular pattern, perfect for the BlackBerry Trackball. The AV|Shadow is set up for TV, Satellite, Cable, Apple TV, TiVo, DVD, DVR/PVR, VCR, Blu-Ray, iPod, Mircosoft Media Center, even gaming consoles like the PS3. The AV|Shadow is enough inspiration for any company, but Unify4Life also has another useful application called the Garage|Shadow. This device turns a BlackBerry into a garage door opener. It is easy to install and use, and now the user doesn’t have to worry about losing their RF remotes any more. Both of these products are available on the Unify4Life website. They are expected to ship in the next few days for a price of $99.99 each. WOW! After decades of having created a digital mobile device, they finally realize they can control anything digital with it? Not impressed at all. This idea should’ve been a reality over a decade ago. We are getting more slower in coming up with ingenious gadgets and inventions. I predict by the year 2012, Japanese will control just about every digital technology that exists.